Updated with quotes and 45th Space Wing release. A SpaceX Falcon 9 rocket exploded in the final minutes of a simulated countdown at Cape Canaveral on Thursday, destroying the booster and an Israeli communications satellite valued at nearly $200 million. The mishap on Cape Canaveral’s Complex 40 launch pad Thursday will raise questions about the reliability of the Falcon 9 booster, which is slated to haul up cargo to the International Space Station, launch dozens of commercial satellites, and eventually send astronauts into orbit. The 229-foot-tall (70-meter) launcher exploded at 9:07 a.m. EDT (1307 GMT), a few minutes before a planned ignition of the rocket’s nine Merlin main engines for a brief “static fire” test designed to wring out problems with the launch pad and the vehicle. Watch a video of the explosion captured a few miles from the launch pad by U.S. Launch Report. The Falcon 9 was scheduled to blast off early Saturday with the Amos 6 satellite, a nearly 6-ton commercial television and Internet broadcast platform owned by Spacecom Ltd. of Israel. The mishap destroyed the rocket and the Amos 6 satellite, SpaceX said in a statement. 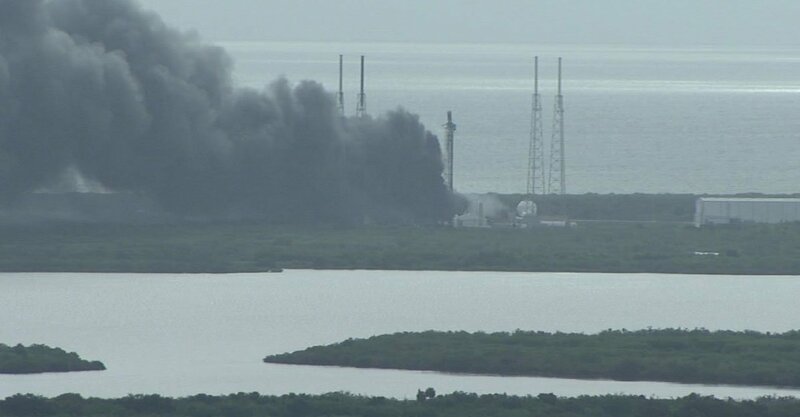 The launch pad was cleared of all personnel for the static fire test, and no injuries were reported. Images captured in the aftermath of the explosion showed black smoke and flames billowing from the launch pad, and damage to the metal strongback tower that feeds electricity, purge air and propellants into the rocket. Nearby structures, such as the launch pad’s rocket integration hangar and four lightning towers, appeared intact. Saturday’s launch was supposed to be the 29th flight of a Falcon 9 rocket. Another SpaceX launcher disintegrated about two minutes after a liftoff in June 2015 with a Dragon supply ship heading for the space station, but the company had logged nine successful flights in a row since resuming launch operations in December. A component inside the Falcon 9’s upper stage liquid oxygen tank was the source of last year’s in-flight rocket failure, according to SpaceX. Officials blamed the failure on a sub-standard strut holding one of the tank’s high-pressure helium reservoirs inside the upper stage liquid oxygen tank. There were no other reports of damage at Cape Canaveral Air Force Station or Kennedy Space Center. A United Launch Alliance Atlas 5 rocket is set for liftoff Sept. 8 with NASA’s OSIRIS-REx spacecraft on a $1 billion mission to travel to an asteroid and return a sample to Earth. Initial assessments show the robotic science probe and its launcher are healthy and secure inside the Vertical Integration Facility near the Atlas 5 pad about 1.1 miles north of the SpaceX launch facility, NASA said. “Days like today are difficult for many reasons,” said Brig. Gen. Wayne Monteith, commander of the U.S. Air Force’s 45th Space Wing, which oversees Cape Canaveral Air Force Station. “There was the potential for things to be a lot worse; however, due to our processes and procedures no one was injured as a result of this incident. Before Thursday’s incident, SpaceX had around nine launches left to execute before the end of this year, according to statements from the company’s numerous customers about their intentions. Next up after the Amos 6 launch was the first of seven Iridium satellite deployment flights Sept. 19 from Vandenberg Air Force Base, California, with 10 spacecraft for the company’s next-generation voice and data relay network. In late October, SpaceX planned to fly a recycled Falcon 9 first stage for the first time with the SES 10 communications satellite to provide coverage over Latin America. SpaceX and SES announced the first-of-its-kind reusable launch agreement earlier this week, after recovering six of its last nine rocket boosters with propulsive rocket-assisted landings. SpaceX’s next space station cargo mission was on track for liftoff in November with several tons of supplies and experiments, including an externally-mounted package of U.S. Air Force research investigations and a multimillion-dollar NASA instrument to study Earth’s ozone layer. Other missions that were on SpaceX’s manifest later this year included missions for Inmarsat, EchoStar, South Korea’s KTsat, another flight for SES, a tandem launch for Taiwan’s National Space Organization and Seattle-based Spaceflight Industries, and the second batch of 10 Iridium satellites. The impact of Thursday’s explosion on SpaceX’s upcoming missions was not clear, but with an investigation underway and the company’s main launch pad damaged, some delays are all but certain. Kirk Shireman, NASA’s International Space Station program manager, spoke with Spaceflight Now Thursday morning shortly after the Falcon 9 rocket and the Amos 6 satellite were destroyed on the launch pad at Cape Canaveral. The space station program is SpaceX’s biggest customer, with three separate multibillion-dollar contracts to ferry supplies to and from the orbiting research complex, and eventually transport astronauts. 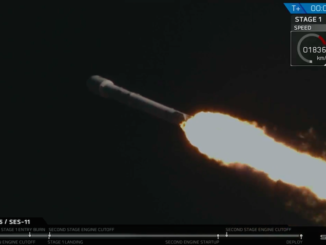 SpaceX has launched nine commercial resupply missions to the space station with its Falcon 9 rocket and Dragon cargo capsule. Eight of those flights reached the outpost, and one failed during the launch in June 2015. The next cargo mission by SpaceX was slated for liftoff Nov. 11, but that date could be in jeopardy after Thursday’s launch pad mishap in Florida. Using a fleet of SpaceX Dragon, Orbital ATK Cygnus, and Russian Progress logistics freighters, officials spent the last year-and-a-half restocking the space station with provisions and science gear after three launch failures in 2014 and 2015. In October 2014, an Orbital ATK Antares launcher crashed moments after blastoff from Virginia, destroying a Cygnus cargo craft heading for the space station. A Russian Progress supply ship spun out of control shortly after reaching orbit atop a Soyuz rocket in April 2015, then a Falcon 9 booster disintegrated in mid-air in June 2015 about two minutes after liftoff with a Dragon cargo carrier. The trio of mission failures never endangered the space station’s crew — they always have a reserve of food and critical supplies — but it diminished the stockpiles managers send to the complex just in case of such problems. “We actively track and plan for logistics on-board ISS, and by logistics I mean not only food and water for the crew, but we’re also talking critical spares for equipment that has to work, like oxygen generation, carbon dioxide removal, the toilet, all those things that really have to work,” Shireman said. “We also track logistics for science. We track what our science program is, and we carry reserve science as well. NASA’s other space station cargo provider, Orbital ATK, is in the final stages of preparing an upgraded Antares rocket for its first flight since the October 2014 mishap. Orbital ATK replaced the Russian-made AJ26 engines blamed for that failure with two new RD-181 powerplants, and engineers have spent the last couple of months wrangling with technical issues to ensure the RD-181s are ready. In the meantime, Orbital ATK ordered two Atlas 5 rockets from ULA for a pair of Cygnus resupply flights in December and March, ensuring the station’s supply chain remained largely intact while the Antares and Falcon 9 launchers were grounded and returning to flight status. Those two missions were successful, and now attention turns to the resumption of Antares launches from Wallops Island, Virginia. Shireman said NASA is treating the re-engined Antares booster — dubbed the Antares 230 — like a “brand new rocket” and will avoid placing one-of-a-kind high-priority items aboard the mission, which is currently slated for late September. If SpaceX’s launch schedule slips — as widely expected — the Antares flight needs to go well to ensure NASA has unfettered access to the space station for cargo deliveries. A Japanese HTV cargo mission is scheduled for launch around December to deliver more equipment to the space station, including six new lithium-ion batteries for the research lab’s huge power truss. A Russian Progress refueling and resupply capsule is due for launch Oct. 20. “Our supply chain, fortunately, has dissimilar redundancy,” Shireman said. “Today, we have HTV, we have SpaceX, we have Orbital ATK’s Cygnus, we have Russian Energia Progress vehicles, and then we have a little cargo we can fly up on Soyuz, too. All those things allow us to carry cargo. “When you lose one of those capabilities, even temporarily, yes, it’s an impact,” he said Thursday morning. “What specific impacts there will be is hard to say. If it’s a disruption, we’ll manage it. We’re very good at anticipating what things could happen and positioning ourselves to be tolerant to those things, and then recovering from them. File photo of the Amos 6 satellite during ground testing. 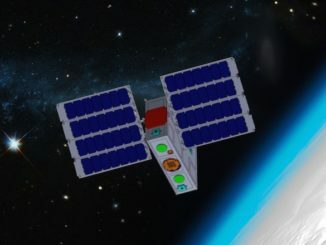 Credit: Spacecom Ltd. Rocket launches are risky, and failures occur regularly, but catastrophic explosions on the ground like Thursday’s launch pad blast are very rare. Jonathan McDowell, an astrophysicist at the Harvard-Smithsonian Center for Astrophysics who keeps a respected catalog of space activities, said he believes the last time such a mishap occurred at Cape Canaveral on an orbital-class rocket before liftoff was in 1959, when an Atlas-Able booster exploded during a static fire test. More recently, a Brazilian VLS satellite launcher exploded on its launch pad in 2003 when one of its solid rocket boosters inadvertently ignited, killing 21 people. That was the last time an orbital-class rocket was lost in a mishap on the launch pad before liftoff. The Amos 6 satellite fastened on top of the Falcon 9 rocket during Thursday’s doomed test was fully fueled with several tons of toxic hydrazine and nitrogen tetroxide propellants for orbital maneuvers. Built by Israel Aerospace Industries, the satellite was about to set off on a 16-year mission to broadcast direct-to-home television across Europe and the Middle East. 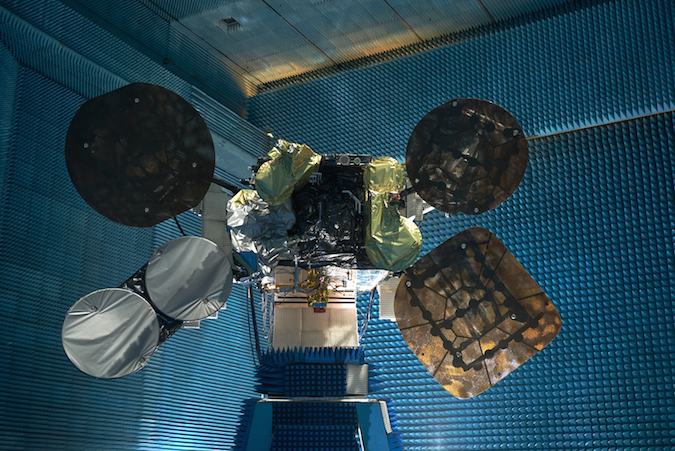 Spacecom signed a $195 million contract with IAI for the Amos 6 satellite in 2012, and the new craft was supposed to replace the aging Amos 2 launched on a Soyuz rocket in 2003. Opher Doron, general manager of IAI’s space division, said in an interview before Thursday’s mishap that the Amos 6 spacecraft weighed nearly 11,600 pounds — 5,250 kilograms — with a full tank of propellant, making it the largest and heaviest satellite ever produced in Israel. Eutelsat and Facebook leased a portion of Amos 6’s communications payload to provide broadband Internet access across sub-Saharan Africa, part of an initiative by the social media company to connect the developing world. “As I’m here in Africa, I’m deeply disappointed to hear that SpaceX’s launch failure destroyed our satellite that would have provided connectivity to so many entrepreneurs and everyone else across the continent,” wrote Mark Zuckerberg, Facebook’s founder and CEO, in a post to his social media site Thursday. 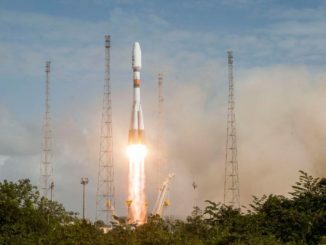 Spacecom has not confirmed whether the spacecraft was fully insured for a total loss before liftoff. Two industry sources familiar with space insurance arrangements for Falcon 9 launches said standard satellite insurance policies should likely cover risks to the spacecraft during SpaceX’s static fire test. SpaceX has always conducted a customary “static fire” test before each launch, using it as a rehearsal for the launch team and as a way to verify the rocket and ground systems are ready. In 2014, SpaceX started regularly executing the static fire tests with the rocket’s payload on-board, first with Dragon cargo capsules heading to the space station, then with commercial satellites.